This Canadian film, directed by the brilliant François Girard, traces the life of a violin crafted in 1681 Italy, that has come to auction in present day Montreal. Filmed in flashbacks amid the violin's history in an Austrian monastery, the hands of gypsies, the hands of a crazed English violinist, and the Chinese cultural revolution, we learn of its fabled roots in the death of its maker's wife, the beautiful Anna Bussotti, whose blood gives the violin both its magical powers, fame, and name. The film is anchored by Samuel L. Jackson, who plays Charles Morritz, the expert brought in to confirm the violin's authenticity. 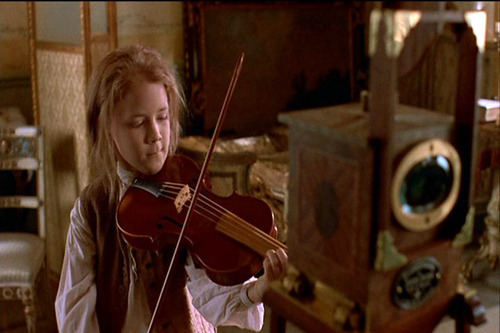 The Red Violin is an adventure, and a mystery, and a journey on so many levels and is a film best described as rich. It is rare in film today in that it is intelligent. Well worth a rent if you're looking for 2 hours of utter immersion in the ethereal power of love and music.